I strongly recommend making preserved lemon when the lemons are abundant. It is super easy – packing lemons into a steralised jar with a plenty of good quality sea salt. The hard thing I find is waiting to ferment. Mine has been in the fridge for several months now. It is seriously magical how adding this little ingredient makes a huge difference in the dish – salty, tangy, zingy and exotic. All you have to do is to add it into the stew, casserole, salad or soup to make the dish amazing. Beans have a bad reputation for causing gas and digestive distress, but it is usually because they have been undercooked or improperly prepared. When you cook beans, soak them overnight prior to cooking, make sure they are not undercooked, add spices like bay leaf, oregano or cumin when cooking to help digestion. 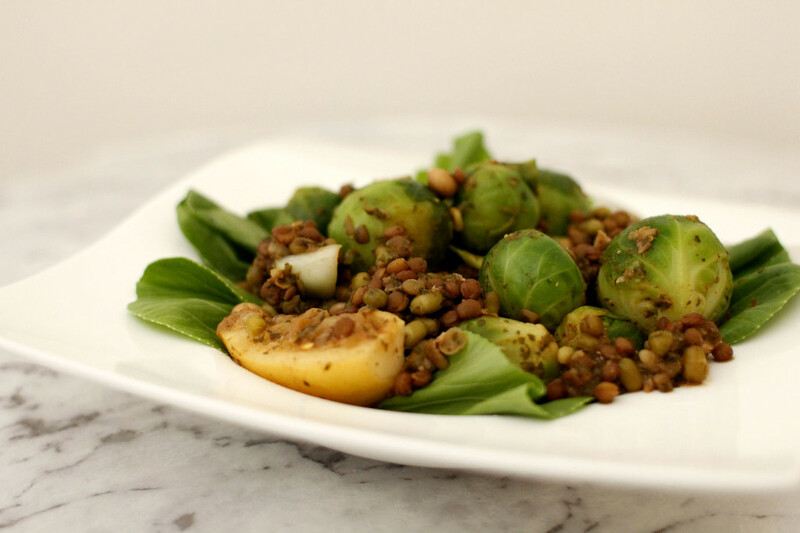 For this recipe, you can cook lentils and veggies separate and mix all together before serve if you are not sure how much lentils need to be cooked. Rinse lentils in cold water. Put in a saucepan, cover with water, add other ingredients in, and cook for about 15 minutes or until lentils are just al dente. Then add brussel sprouts and roughly chopped the bottom half of the bok-choy into a pan and cook for another 10 minutes or until veggies are cooked. Keep stirring around and add a bit of water if too dry. Arrange the green parts of the bok-choy on a plate. Remove a bay leaf. Mix toasted pine nuts through the lentils and transfer to a plate. Serve warm.